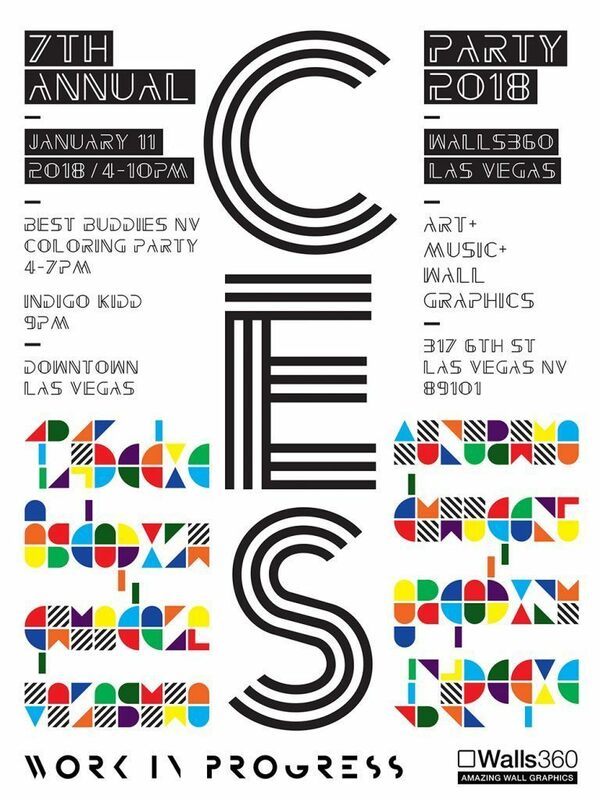 The 7th Annual Walls360 Las Vegas CES Party comes to Work in Progress on Thursday, January 11 for an evening of networking, art, music, and technology.Walls360 has quite the evening planned for us.From 4 PM until 7 PM, share some joy at the Coloring Party with Best Buddies Nevada. Best Buddies is a nonprofit organization that helps people with intellectual and developmental disabilities make friends, find careers, and become leaders within their communities. These coloring parties are all about growth, inclusion, and fun.At 7 PM, the official 2018 Walls360 CES Party gets into full swing with a pop-up art show, giveaways, performers, and an augmented reality art installation from Mystic Midway in which guests are invited to participate. Indigo Kidd takes the stage at 9, and the Walls360 CES Party wraps up at 10 PM.This promises to be an evening of unexpected connections, blossoming creativity, and good ol’ fashioned DTLV spectacle. If you have questions about the party, get in touch with Walls360 and they’ll tell you what’s up. Walls360 is a Vegas-based company that creates gorgeous wall graphics and promotional products for artists and brands worldwide.As a company, they believe in creativity, connectivity, and the creator culture that supports artists worldwide. The team at Walls360 is part geeky, part artsy, and they enthusiastically support entrepreneurship in the creative community.Their wall graphics look like painted murals, but they can be repositioned or removed without damage to the wall beneath.From small emoji decals to 8-foot cityscape wall art, Walls360 covers a little bit of everything. Their custom promotional materials and artist collaborations back up their mission to help share artists’ voices. Check out their website to see some of their vast selection.